This use case shows how to use Gates On the Fly to do ECO by mixing Automatic Mode and Manual Mode. When Manual ECO is possible, it normally gives better solution than Automatic Mode. Pure manual work done on netlist text file directly is tedious and error-prone. Gates On the Fly supports GUI Mode and Script Mode to improve efficiency and accuracy of Manual ECO. In Script Mode, GOF has rich API sets to boost performance of Manual Mode ECO. The following use case shows how to save hundred gates by mixing Automatic and Manual ECO. The netlist under ECO has one input bus port driving two combinational logic clouds (LOGIC A and LOGIC B) which may have overlap and drive two sets of flops STATE_A_reg and STATE_B_reg respectively. 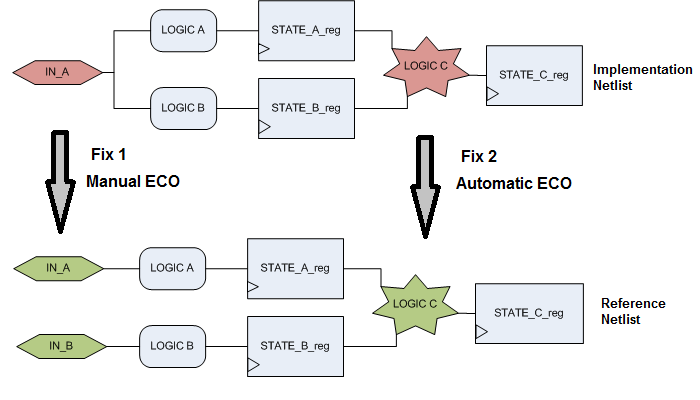 The ECO requires a new input port "IN_B" being added to drive "LOGIC B" and flop "STATE_B_reg". And other flop "STATE_C_reg" has modifications as well which will be done by Automatic Mode. The input bus port has width of 96 bits, when Automatic Mode ECO applies on the whole module, total ~120 new gates are needed in IN_A/IN_B separation. These new gates can be absorbed in full layer ECO. However in metal only ECO, it maybe impossible to find enough resources for these new gates. A basic analysis on port "IN_A" shows, the port has two sets of fanouts, one is for "LOGIC A", the other is for "LOGIC B". If we can separate out the fanout for "LOGIC B" and reconnect the driver to port "IN_B", the ECO in this spot would be done without any new gate added. Or if there are few gates shared by "LOGIC A" and "LOGIC B", duplicate these gates and drive them separately. Gates On the Fly has APIs to do this type of Manual ECO. So we decide to have two parts of ECOs, Fix 1 uses Manual mode, and Fix 2 uses Automatic mode. The mixed mode has only 15 new gates added which are all for 'LOGIC C' changes. Mixing Automatic ECO Mode and Manual ECO Mode can greatly improve ECO quality. It is especially important in Metal Only ECO where resource is very limited.